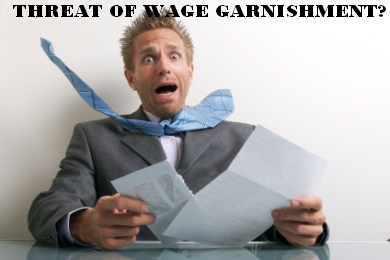 Threat of Wage Garnishment is often used by scammers posing as debt collectors to coerce cash from people. Most of these calls have no connection with any loan that the victim might have taken. The calls are usually extortion attempt to scare a victim to pay. The money paid by the victim goes to the criminals, not to any payday loan company or debt collector. Consumers need to know that a Lender or a Debt collector CANNOT get your wages garnished by simply writing to your company! There is no such provision in law. Even if you have agreed (in the loan agreement) that wages be garnished in case of a delinquency, the lender or debt collector has to obtain a court order to get wages garnished. Federal law allows federal agencies to require employers to garnish employees’ wages without a court order, when the employees owe the government money. That’s only when you owe money to the Government! So the talk of a debt collector or a lender that “your wages will be garnished”, if you do not pay cash within certain period, is nothing but a hollow threat. A court process for wage garnishment is a long drawn affair and you would be very much aware of the process, since you would have received court notice by mail. You will NOT receive a genuine Debt Validation Notice from the callers who make scare calls. They are part of criminal extortion gang who has got hold of your phone number from a random list of people. They may have some personal info which is again stolen from various sources. Don’t make the mistake of giving them your address or names of your family members and any other personal info. If they call you again be firm and tell them that the call is being taped as advised by the Police Department and that you have filed compliant with the Local Sheriff’s Office, FTC and the FCC. Once the scammer knows he has just called a tough nut who is aware of scams, he will not call again. He will tick you off the list. The reason is simple! There is no gain for scammers in calling someone repeatedly, once they know that the target of scam is not going to fall for it! It would be a waste of resources and time for the scammer to follow up with people who are never going to pay. Remember, if you are soft, you will be scammed one day or the other. The crooks won't leave you alone, once they know you are a soft target. If you were a resident of State of Pennsylvania, North Carolina, South Carolina or Texas when you obtained the loan, your wages can not be garnished by a private lender. The law of these states prohibits wage garnishment by private lenders and hence they cannot obtain a court judgment to garnish wages. Did you ever get such threatening calls? Share your experience in the COMMENTS section below, for the benefit of other consumers.